Microneedling is an exciting new skin treatment used in the Atlanta, Georgia area and across the United States. This procedure is also known as Collagen Induction Therapy (CIT). It is a minimally invasive way to perform a facial that will quickly boost the skin’s collagen and elastin production, two natural substances that are key to skin rejuvenation. In order to perform this skin treatment, Georgia Dermatology Med Spa uses a SkinPen. 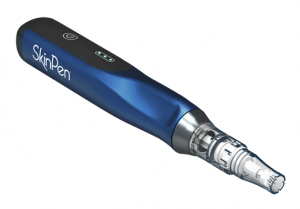 This is a handheld, medical-grade device, which is the only FDA cleared microneedling device on the market. The medical aesthetician rolls the pen onto the skin’s surface. Finally, very fine, tiny needles on the device puncture the skin and trigger the release of growth factors that stimulate collagen and elastin in order to smooth, plump, and firm the skin. The application of a topical anesthetic cream is usually applied to the skin first to ensure there is no discomfort felt. Different needle lengths are used, depending upon what the patient would like to accomplish. The patient will receive a complimentary SkinPen + SkinFuse Treatment Kit to use at home. Microneedling can be safely and effectively performed on the face, neck, hands, and décolleté or chest area. During the procedure, a person will feel as though a fine-grade sandpaper is being rubbed on their skin. The reciprocating needle tip moves very rapidly, reducing discomfort, along with the help of an application of hydrating gel. This type of skin treatment takes between 30 and 60 minutes to complete, depending upon the surface area size being worked on. Immediately after the procedure and upon leaving Georgia Dermatology Center, the skin that was treated will appear as though it is sunburned. The redness can last anywhere from two to four days, with some patients seeing their skin return to normal within 24 hours. Using high-quality skin care products provided by Alexander Gross, M.D. and his staff will help in speeding up the healing time. Patients will note positive changes taking place over the coming days and weeks after the procedure, for up to six months, as collagen production continues. A single treatment performed once a year can garner excellent results, though two or three applications done about seven weeks apart are optimal. For those who wish to treat deep wrinkles or acne scars, more sessions performed at shorter intervals are recommended. Alexander Gross, M.D. at Georgia Dermatology Center supervises all the cosmetic procedures performed by their medical aestheticians. In addition, their medical spa provides all of the current, top-notch, minimally invasive procedures such as microdermabrasion, FotoFacial, facials and peels to rejuvenate skin. The content on this web page is not meant to take the place of professional medical advice. If you are considering a microneedling procedure or have other dermatological concerns, please contact the staff at Georgia Dermatology Center to receive more information or to make an appointment.